“But then, as she looks at their unsuspecting, uninterested faces, she will start to think about what that really means. That just like there is more to her than what they see, there is more inside each one of them. What’s your story? she will wonder as she scans the room from face to face. And this time, when she pleads with them to read between the lines, she will try to do the same." We live in a small town and I work in the school of that small town and when I look around I see groups of mates, hanging out, being, doing, chatting, planning. Most students are in a group, most students understand what the culture of school is, most know that you have to lock yourself in a group, get your identity from that group and hold on tight to survive school years. 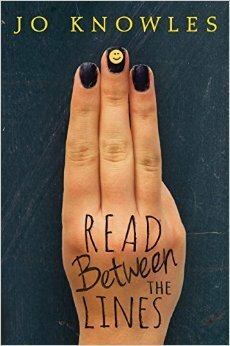 This book is just about that- one day in the life of a school, the groups, who they are and how they intersect and interlock. Nine teenagers, one adult, one day, and one rude gesture that connects their stories. Told in ten vignettes, Jo Knowles’ story shows the face of human life and the personal struggles that underlie each character’s actions. It also shows the real and tenuous connections between both friends and strangers.